Medical assistants are in great demand in Washington, with double-digit job growth expected well into the current decade. 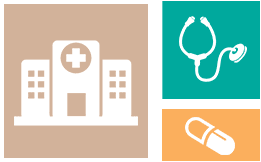 Medical assistant schools and programs are available in several different educational venues in Washington, including community colleges and vocational schools. While medical assistant salaries vary depending on the area, the hourly median wage in Washington is almost $2 more than the national wage. Unlike most other states, medical assistants in Washington can become certified or registered by the state department of health. This shows that the state recognizes the contributions medical assistants make to healthcare in the state and understands the importance of ensuring excellence in the field. Find out what's required to join the ranks of registered or certified medical assistants in Washington, including education, certification and more. Students interested in beginning a career as a medical assistant may wish to consider completing a fulfilling online program in medical assisting. Students learning in these programs develop skills in understanding medical ethics, properly processing medical billing and insurance, and even assisting in basic and advanced medical procedures. We’ve taken the time to look through the programs offered throughout Washington and compiled a list of the best schools in terms of student success rate and post-graduation job placement. 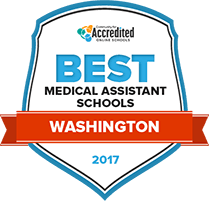 Check below to find our list of the top medical assisting programs in Washington for 2017. The 78-credit medical assistant certificate program at Renton Technical College takes four quarters to complete. Those pursuing an associate of applied science degree will complete 98 credits in six quarters. Although hours may vary, students can expect to engage in coursework and classes from 8 a.m. to 2:30 p.m. The RTC library offers a wealth of academic resources, including research and study tools. Students will receive guidance from qualified advisors, and will have access to career resources, counseling services, disability services and LGBTQ resources. There are also many clubs, organizations and on-campus activities. Students will be qualified to sit for the Certified Medical Assistant national exam once they complete the medical assistant program at Lower Columbia College, which is accredited by the Commission on Accreditation of Allied Health Education Programs. Coursework includes a broad array of topics, including communications, human relations and quantitative skills. Student services and activities include e-learning, dining facilities, academic advising, a gym and fitness center, multicultural programs and computer labs. Child care is available, as are a range of library services, including research tools and study areas. Tutoring, transfer and counseling services are also available. The medical assisting program at Whatcom Community College has changed in recent years to align with state laws regarding credentials. The curriculum is specifically designed to prepare students to work with electronic medical records in the digital age. Student services at Whatcom include access and disability services, career services, counseling and academic advising. Specialty services include an Intercultural Center and the LGBTQ Student Success Initiative. There is a student newspaper, a student recreation center and several athletic programs. There is also a special program designed for baby boomers who are pursuing education later in life. Graduates of the Clark College medical assisting program, which is accredited by the Commission on Accreditation of Allied Health Education Programs, will be ready to sit for the American Association of Medical Assistants exam, and they will also be qualified to test for national certification. The campus boasts a wide range of cultural offerings, including an art gallery, a choral festival, a jazz festival, concerts, a Sakura festival, theater productions, a science Olympiad, a writers series and celebrations honoring Native American and Latin heritage. Students will receive academic counseling, career services and, for those who need it, disability services. The South Puget Sound Community College medical assisting program results in graduates earning an associate of applied science degree, which qualifies them to take the certified medical assistant exam. Upon receiving certification, graduates will be ready to begin work in entry-level positions in broad range of environments, including doctors offices, clinics and outpatient facilities. The college's career resources program includes a focus on local health care career paths. Other services include an advising center, as well as tech support and academic support. Personal support services include mentoring and counseling, as well as access to the Diversity and Equity Center. Big Bend Community College offers a medical assistant program that is in full compliance with the state's most recently updated law regarding the ability of students to obtain licensure and certification upon graduation. Those who complete the program will be uniquely qualified to begin work in a variety of medical settings to perform both front-office administrative tasks and back-office clinical work involving patients and medical professionals. Throughout their academic journeys, students will benefit from career services, academic advising, tutoring and counseling. There are also a host of clubs, activities and athletic groups that students can join. The medical assistant program at Spokane Community College lasts for an average of four quarters for the certificate and seven quarters for the associate of applied science degree. The program, which is accredited by the Commission on Accreditation of Allied Health Education Programs, includes a clinical phase that prepares students with hands-on training in competencies including reading vital signs, preparing patients for procedures, and administering first aid and CPR. There is also an administrative aspect of the program that teaches students how to perform administrative and clerical duties. Students will benefit from a broad range of services, including career counseling and academic advising. Students can pursue the medical assistant program at Everett Community College, which boasts a high retention rate and a wide selection of student services. Among them are a student fitness center and a library that contains a variety of databases, research tools, print and electronic books and periodicals, as well as computers, a media center and study areas. Students will have access to a Diversity and Equity Center, as well as a center for counseling and student success, which offers career, educational, academic and personal guidance. Students can join or interact with the student government, and participate in any of several clubs, activities and organizations. How does Washington State define "medical assistant?" Medical assistants are skilled practitioners who perform a wide range of roles in healthcare settings while carrying out administrative and clinical duties. In addition, the duties of a medical assistant-phlebotomist include capillary, venous, arterial invasive procedures for blood withdrawal, CLIA waived, moderate and high complexity tests, and EKG. A medical assistant-hemodialysis technician operates a dialysis machine that helps patients with reduced kidney function eliminate toxic waste from their bodies. Do medical assistants have to be certified in Washington State? Washington State requires people in healthcare facilities who act as medical assistants to have a Department of Health (DOH)-issues credential. Practicing as a medical assistant includes duties such as administering vaccines and intravenous injections, assisting in certain medical procedures, and withdrawing blood. What are the classes of medical assistants accepted under Washington State law? What certification exams are accepted by Washington State? Washington recognizes the following certifications, which can be obtained by attending an accredited program and passing a certifying exam. Are medical assistants in Washington State allowed to call in prescriptions or prescription refills? Because the medical assistant statute does not address prescriptions, medical assistants need to consult with their supervising healthcare practitioners to determine what their duties should be relating to calling in and refilling prescriptions. Who can supervise a medical assistant? Does Washington State medical assistant certification need to be renewed? Yes. The credential must be renewed every two years on the credential holder's birthday. Compare medical assistant earnings in Washington with national salary figures with the 2014 Bureau of Labor Statistics (BLS) data below. Medical assistant salaries vary according to the geographical area, as illustrated by the 2015 BLS wage amounts in the map below. The highest paying wages in Washington are located in the Seattle, Tacoma, Bellevue area while the lowest wages are in the Kennewick, Richland area. Medical assisting jobs are expected to grow 29 percent from 2012-2022. An increase in available technology and a growing population of older adults are contributing to the growth rate for Washington medical assisting jobs and the rest of the country. The table below compares Washington medical assisting job growth with national growth. While there are many medical assisting programs available at a wide variety of community colleges, private career colleges and vocational schools in Washington, we've chosen a small sample to help you begin your search. This document from the American Association of Medical Technologists outlines the medical assisting law that came into effect July 1, 2013. Learn about Washington medical assisting salaries and sort through job listings. Find out how to become a certified or registered medical assistant and renew certification in Washington State. This fact sheet explains the requirements to apply for a Medical Assistant-Certified credential from the Washington Department of Health. WSSMA is a member organization under the American Association of Medical Assistants (AAMA) that provides continuing education, scholarships, networking, accreditation information, and an online newsletter for medical assistants in Washington.